Let’s see… Issa’s committee is conducting contempt hearings against Eric Holder as we speak because the A.G. refuses to comply with a subpoena. During all that, President Obama, who had never heard of Fast & Furious and knows nothing about it, invoked executive privilege to protect something he’s totally unfamilar with from being made public… whatever it is... Speaking of blaming Bush, the Justice Department just retracted a claim Holder made last week that his Bush administration predecessor had been briefed on F & F. In other words, Holder lied to Congress. 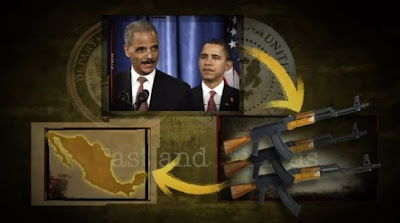 Project Gun Runner (Fast and Furious) was launched under the orders of President Barack Obama with the knowledge of Attorney General Eric Holder. Deputy Attorney General David Ogden announced the Obama Administration’s new and aggressive ‘comprehensive plan’ on March, 24, 2009. The plan was aimed at disrupting gun trafficking between the United States and Mexico. Is this what Eric Holder meant by his threat [last week] of [an impending] Constitutional Crisis? ... If so, then by their own admission, Obama and the Department of Justice is admitting that they are caught in a corner and the only way out is putting the Constitution in peril. Thanks to the insights of a famed constitutional scholar in 2005, we can assert the following. 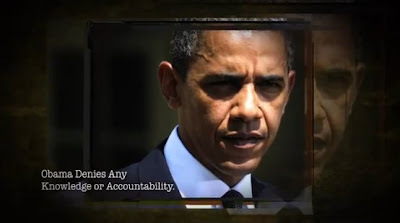 • Eric Holder refuses "to put the Constitution of the people before the political agenda of the President"
In 2005, then-Senator Obama had some pretty strong ideas about what the Attorney General’s duties were. Speaking on the Senate floor during the nomination confirmation of President George W. Bush’s Attorney General nominee Alberto Gonzales, Obama explained why he opposed the nomination. In a desperate attempt to prevent the contempt vote in the last few hours, Holder asked President Obama to invoke executive privilege to shield these 1,300 pages of documents from Congress, and the President apparently agreed to do so. Yet that is not the end of the story. Even if properly involved, the Supreme Court has made clear that executive privilege is not absolute. DOJ must provide an explanation why all those documents fit one of the recognized categories of executive privilege. It is questionable whether they all are legitimately subject to executive privilege, for several reasons. For more than a year now, the Obama Justice Department under leadership of Attorney General Eric Holder has been stonewalling the House Oversight Committee's independent investigation into Operation Fast and Furious, citing an on going investigation within DOJ by the inspector general. DOJ has asked Congressional investigators to wait for the inspector general's report and before pushing for more information about the program... Out of 80,000 documents requested for review by Oversight Chairman Darrell Issa, Holder's DOJ has turned over 6,000, leaving 74,000 with the [I.G.] ...Despite the so-called "ongoing," year long internal investigation by the inspector general, Eric Holder has yet to be interviewed. Will the last one to leave vintage media's newsroom please turn off the lights? Aside from Fox News and CBS' Sharyl Attkisson, no vintage media outlet publicized the thousands of murder weapons, the lies coming from Holder's DOJ, and the subsequent coverup. 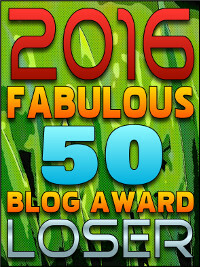 Bloggers Mike Vanderboeugh and David Codrea did the job -- along with several brave whistle-blowers -- that network news and print media used to do (before they became so wedded to partisan hackery that they abandoned the journalism profession). As Charles Krauthammer pointed out this evening, Eric Holder's claim that he can't turn over documents because it would endanger the American people, is ludicrous. Not only are the requested documents non-operational, but his claim comes on the heels of an unprecedented series of leaks that have been pilloried by Democrats and Republicans alike. Coincidentally, each of these leaks appear to have one goal in mind: to make Obama appear as though he has a handle on national security (hint: he doesn't). Today, Rep. Sheila Jackson Lee, possibly the dumbest person ever to walk the halls of Congress, blamed Bush for the Fast & Furious debacle. If that’s the case, since when does the Obama administration go out of its way to protect Bush? Okay, maybe Jackson Gump didn't mean to imply that Obama is protecting W. That's just the way it came out. Long ago, the who-knows-whether-he's-fictional 'White House Insider' asserted that Eric Holder is the key to Obama's secrets. Looks he got another one right. Related: Make it viral: the Fast and Furious ad you've been waiting for. Zero claims he didn't know about F&F. Really? Then why did he launch the program? 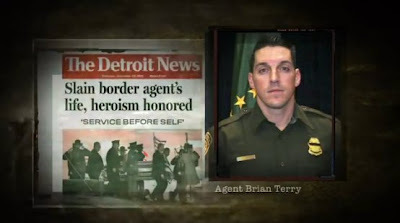 There is enough evidence presented to Congress to arrest him and prosecute him for an Act of War against the nation of Mexico, accessory to murder of thousands of innocent citizens in Mexico and America as well as the murder of United States Border Patrol agent Brian Terry. Besides sending illegal guns to Mexico, Holder and Obama sold guns to criminal street gangs inside the United States where the guns will be used inside the United States. It will take years to find the thousands of guns these criminals sold to killers. Eric Holder and his criminal operatives in his office and the Department of Justice need to be dragged out in handcuffs, jailed with no bail and put on trial with a jury of American citizens who are not federal government employees. This reminds me of the time Zero accepted an award for transparency ... in a private, closed to the press meeting. Am I mistaken(? ), is that Eric Holdhim spooning with Borat Obama? Why yes it is. Now we'll never get to hear the 18.5 minute gap in the tape... you know, the one where Eric uses his mouth to imitate him machine gunning the Mexicans in that Oral Office meeting. OK, so I watched MSNBC and Jon Stewart/Stephen Colbert and wondered, are they going to spin this for Obama or are they finally going to tell the truth? They spun it for Obama! Rachel Maddow explained it all for you, saying, "If you haven't heard about Fast & Furious before, you can be excused. No one's been covering it." As if ignorance is a badge of honor! She then said that it was all a plot from Fox News and crazy conservatives. Never once did Rachel Maddow mention the fact that PEOPLE HAVE DIED. 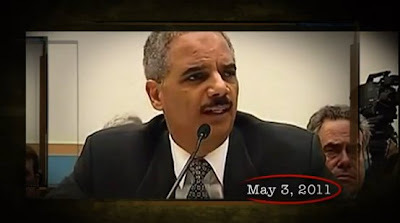 Never once did Rachel Maddow mention the fact that ATTORNEY GENERAL ERIC HOLDER LIED UNDER OATH TO CONGRESS. Never once did Rachel Maddow even mention the words "EXECUTIVE PRIVILEGE." And you just know, had this been the George W. Bush administration, she'd be mentioning all of these things. Jon Stewart and Stephen Colbert also went easy, not blaming Eric Holder or Obama for anything. It's just a crazy Fox News thing--nothing to see here. This has been a week where the President of the United States has made unconstitutional power grabs. Our mainstream media just rolls over and says nothing! I can't yet believe it. Amazing that the book "Obama, The Republican Conspiracy" has inside info about this and was published weeks ago. Amazing book by the way. 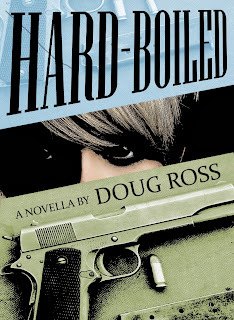 All of your readers should get it. Extremely interesting about Osama Bin Laden still being alive! Hey I got that book just yesterday on my Kindle. Just started but is amazing so far. This guy really has an inside track. So long as we have a senate that won't take any action thanks to Democrat control, there isn't much we can do except continue to work through the judiciary which will mean there won't be any real justice until well after the elections. President Obama Hits the Economic Trifecta!